One of the things I most missed from home in the USA after moving to Colombia was the lack of beer selection, especially craft beer aka cerveza artesenal. In fact, when I arrived in 2011, there were next to no craft beers brewed in Colombia. Fortunately, Colombian craft beer has really been catching on the past few years, and the number of craft beers brewed in Colombia has been growing exponentially. That’s a good thing for beer lovers like me! If you’re a fellow beer lover traveling or living in Colombia, read on for a guide to some of the top craft beers made in Colombia you absolutely need to try. Craft beer is growing in popularity in Colombia. Read on to learn about some of the best Colombian craft beers. Colombia’s beer market is dominated by conglomerate Bavaria. Owned by AB InBev, Bavaria produces the beers Aguila, Club Colombia, Poker, and several other smaller brands that together hold 99% of Colombia’s beer market. Nearly all of them are American Lager clones in the vein of Bud, Miller, and Coors. However, there are some craft breweries operating in the country, and Colombian craft beer has lately really been catching on with Colombians and increasingly available. In this post, I’m going to run down the best Colombian craft beers I’ve been fortunate enough to try. If you’re hunting for craft beers made in Colombia, Bogotá definitely offers the largest variety of microbreweries, brewpubs, and bars with craft beer on offer, but increasingly craft beer brewed in Colombia is being sold in the national supermarket chains and served in more bars all over the country every day, including in Cartagena. *Be sure to also check out our post on where to find craft beer in Cartagena to see where you can sample some of these Colombian craft beers here in the city. BBC was the brewery that started the craft beer revolution in Colombia. Calling itself the “largest small brewery in Colombia,” BBC has gone from a few brewpub locations in Bogotá to pub locations and distribution to most of the country’s major cities’ bars and supermarket chains. Bogotá Beer Company is our top choice for the Colombian craft beers you should try. BBC’s tagline “welcome to the 1%” may not be quite so true since it was bought in 2015 by AB InBev, but it has remained committed to brewing up good, quality Colombian craft beers. The takeover has certainly helped them have a larger distribution chain and they are now easily found not only in more bars and supermarkets, but even in lots of corner tiendas. BBC has a set of 4 standard beers and a number of seasonal brews available for part of the year. Their 4 standard brews are: Premium Lager, Cajicá Honey Ale, Monserrate Roja Red Ale, and Chapinero Porter. All are very good, although my personal choices would be the Chapinero and Cajicá. However, my favorite BBC brew of all is the Septimazo IPA, one of BBC’s seasonal brews. Their pumpkin ale Triqui Triqui is also very good. BBC has their own brewpubs and bars in most of Colombia’s major cities, and many supermarkets and bars carry at least the lager now. Their location in Cartagena tops our list of places that serve great craft beer in Cartagena. Learn more about the first and still best Colombian craft beer at BBC’s website. I’ve become a huge fan of Chelarte’s beers. Most importantly, the beers are really good, but they also have a clever marketing campaign. 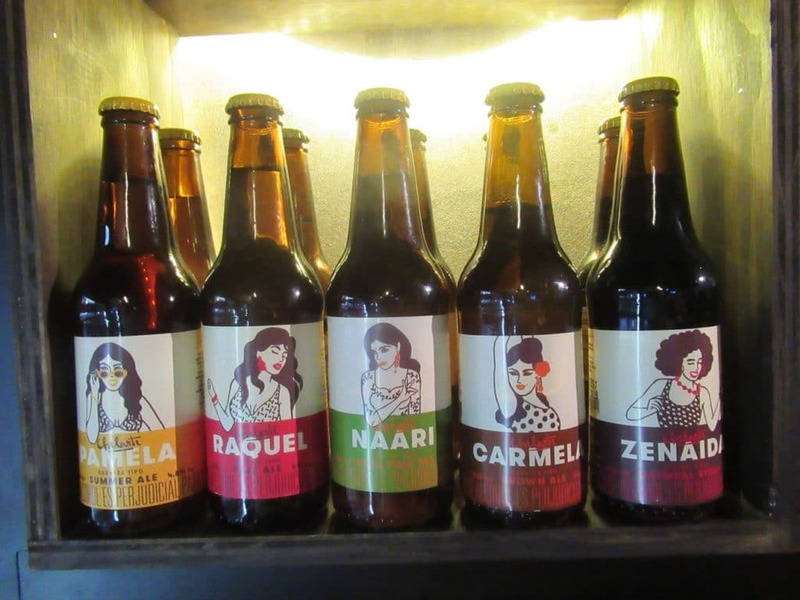 All their beers have women’s names and the labels have the fictional women showing off a personality that matches the beer style. Chelarte names each of its beers after a woman who embodies the beer’s style, a unique naming convention for their Colombian craft beer. The styles they have on offer are: Pamela, a blond summer ale for the surfer chick, Raquel, a sweet but bitter red ale for the flirtatious but sassy redhead, Carmela, a sweet and smooth brown ale for the sensual and vibrant dancer, Oneida, an oatmeal stout for the strong black woman with an Afro, and Narri, a bold and hoppy IPA for the adventurous and Indian traveler. You can read more about the styles in a clever “creation story” in this article (in Spanish). I really like all of Chelarte’s beers styles, although I think Naari is my favorite. It just edges out the BBC Septimazo as the best Colombian IPA in my opinion (if you haven’t caught on, I’m a big IPA fan). 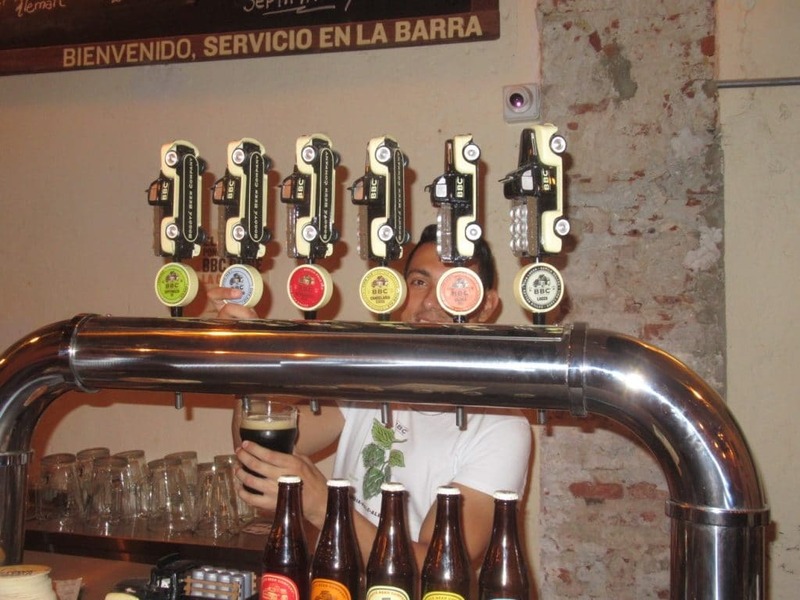 Chelarte has a brewpub in Bogotá, but can be tough to find in Cartagena. Beer Lovers almost always has all the styles in bottles and frequently several on tap. Pick your favorite style or pick the girl you’d most like to have a date with, but be sure to try at least one of Chelarte’s great Colombian craft beers. See Chelarte’s website here and facebook here. Located on the La Victoria Coffee Plantation in Minca, Nevada Cerveceria has been turning out some top class and unique Colombian craft beers. I really appreciate that unlike a lot of the microbreweries here, they’ve gotten a bit more creative with some of their styles and ingredients instead of sticking solely to a handful of standard styles. All their brews are called happy and have nature themes inspired by the wildlife of the Sierra Nevada mountains. 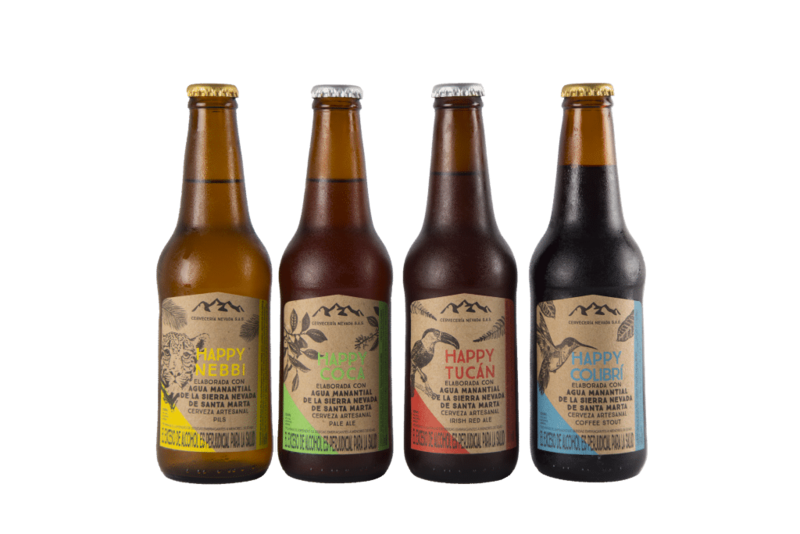 The three main styles are the Happy Nebbi, a Pilsner, the Happy Tucán, a great Irish Red Ale, and the Happy Coca, a pale ale brewed with coca leaves. They also have a coffee stout named the Happy Colibrí listed on their facebook page, which I am very disappointed to say I’ve never been able to try. Hopefully, it will find its way to Cartagena (or I will find my way to Minca) to try it soon! Their beers can be found at Beer Lovers and Cartagena Craft Beer in Cartagena as well as many of the cafes and restaurants in Minca. Check out our travel guide to Minca, a beautiful mountain town outside of Santa Marta, if you’d like to go straight to the source of this great craft beer made in Colombia! Find out more about Nevada Cerveceria’s Colombian craft beer at their facebook page. Based in Medellín, Tres Cordilleras has been around for a while, but has only recently started to have a truly national distributional reach. While long a mainstay at bars in its hometown, it it can now be found consistently here in Cartagena. And that’s a good thing, as their beers are very solid. 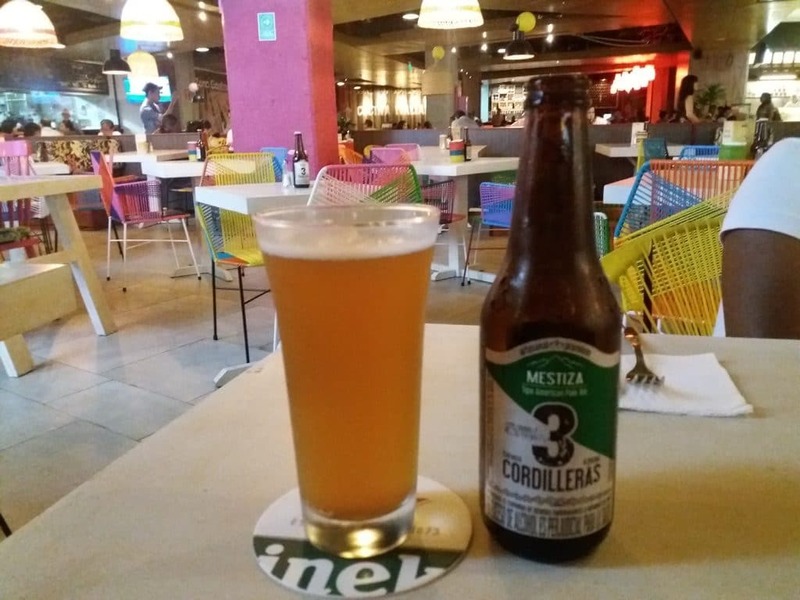 The Mestiza is Tres Cordilleras signature Colombian craft beer. Tres Cordilleras was founded by a former employee at Sweetwater in Georgia, and their signature beer is a Sweetwater 420 clone known as the Mestiza. They also offer the Blanca Wheat Ale, Mulata Amber Ale, Negra Sweet Stout, and Rosada Rosé. The Mestiza and Mulata are my favorites. 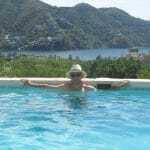 A decent number of bars and restaurants in Cartagena now serve Tres Cordilleras, and it can be found in some of the supermarkets. If you are traveling to Medellín during your time in Colombia, you can also visit the brewery on Thursdays and Fridays. I did the tour several years back and really enjoyed it! Learn more about this craft beer brewed in Colombia at their website. Apóstol brews good German style beers. For a while it was pretty common to find it in the supermarkets and at a handful of bars. In fact, I think it was the first craft beer I found with any regularity in Cartagena. However, it’s become pretty rare again. That is a shame because Apóstol’s beers are very good. They offer the Helles, a traditional German lager, the Weizen, a hefeweizen, the Marzen, an amber ale in the Oktoberfest style, the Dubbel, a Belgian double or strong brown ale, and the Bock, a dark lager. Ok, maybe they are not the most creative with the names, but all of their beers are good and quality representations of the styles. El Bistro used to do a great happy hour deal on Apóstol draft, but it isn’t listed on their menu anymore, and I’m not sure where else you can find it on tap in Cartagena. If you do run across it on a menu or in the supermarket, you won’t be disappointed trying it if you’re a fan of German beer. If you are in Medellín, you can do the tour or even get beers delivered direct from the brewery. Learn more about Apóstol Colombian craft beer at their website. Cervecería Tomahawk– They have a great American Pale Ale, look for the label with a wolf howling. When I see it in stock at Beer Lovers, I have to go for one. I haven’t been able to try any of their other beers though. You can learn more about them at their facebook page here. 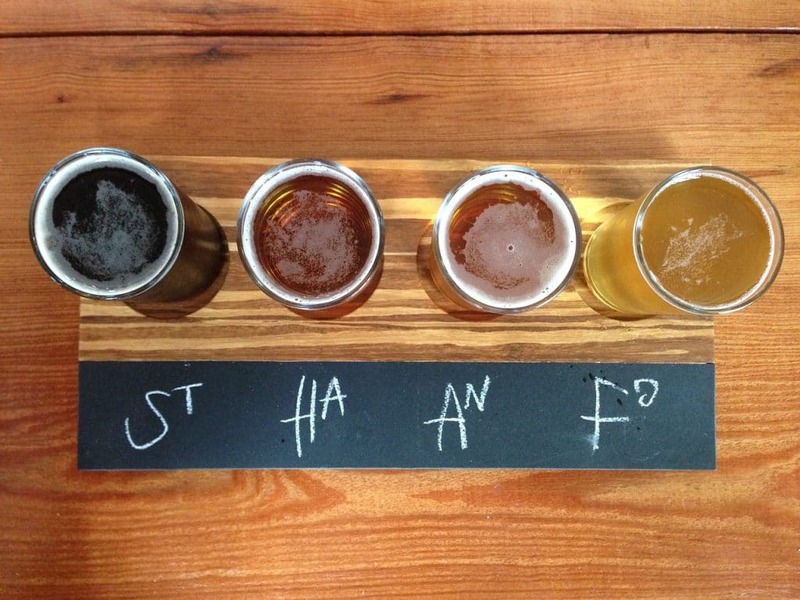 Cervecería Manigua– With creative names and rarer styles, Manigua brews the Mohan Strong Ale, and the Llorona Saison, and the Muelona Bitter Ale. All their names are after supernatural figures from Colombian folk horror stories. In Cartagena, they can usually be found at Beer Lovers, and you can visit their brewpub in Bogotá. Check out their facebook page here. Cervecería Moonshine– Also brewing up some interesting and creative beers, Moonshine is based in Bogotá and according to their website available in a number of bars there. In Cartagena, Beer Lovers usually has some of their styles in stock. Their Pepper Strong Ale has a unique spice to it. You can learn more about Moonshine at their website. 13 Pesos– Out of Bogotá, I’ve only managed to try 13 Pesos once here in Cartagena and have nothing to complain about. Learn more at their website. Tres Guerreros.– Another small outfit out of Bogotá, I’ve only managed to find Tres Guerreros once here in Cartagena as well. I found their beer good. Learn more here. Marantá– Based out of Monter´ía, Marantá’s beers are all named after breeds of horses. I only recently stumbled upon their Alazán, red ale and thought it had a very good strong flavor. Learn more at their website. Statua Rota Taberna– Last time my wife and I were in Bogotá, a friend introduced us to this brew pub. They had some good beer, including a seasonal high gravity Rye, so they clearly make up some unique brews. While you can only get the beer there, if you are in Bogotá check them out. I’m sure there are lots of other local microbreweries and brewpubs turning out great Colombian craft beer that I haven’t discovered yet, particularly in Bogotá. Hopefully, that trend continues and craft beer in Colombia only becomes more popular and prevalent! If you do discover another good one not mentioned here, let me know about it in the comments below. It’d be both a personal favor and a public service! Also, you can check out this online directory to microbreweries in Colombia listed by city. Looking for the best Colombian craft beer in Cartagena? Be sure to check out our rundown of places where you can find good craft beer in Cartagena! Ready to plan a trip to Cartagena? Great post and information. Thanks!